When the BBC program "Life of Birds" with David Attenborough chose a modern bird to illustrate how prehistoric Archaeopteryx might have evolved the power of flight over epochs of time, from a fast-running predatory dinosaur to a short-gliding long-legged bird, they chose to morph the fossil beast into today's Red-legged Seriema (left). And indeed, today's two species of seriema in southern South America appear to be derived from Pleistocene fossil birds which were once giant, flightless predators (known as phorusrhacoids) of now-extinct fauna (Gonzaga 1996). The Seriemas are an ancient and poorly-known group of but two species -- the Red-legged and the Black-legged Chunga burmeisteri -- and both are diurnal hunters in semi-open drier landscapes south of the Amazon basin. The Red-legged is more widespread, ranging in cerrado vegetation from eastern Brazil to central Argentina, while the Black-legged in a bird of Chaco woodlands in Paraguay and northern Argentina. There has been and continues to be much debate about the taxonomic relationship of seriemas. In older times they were grouped with that other diurnal bird of prey that runs on long legs, the Secretarybird Sagittarius serpentarius of Africa, but more recent evidence (including tentative DNA results) has placed the seriemas in the Gruiformes (cranes/rails order) rather than the Falconiformes to which the Secretarybird belongs. But whether seriemas are most closely related to trumpeters (Psophiidae), bustards (Otididae), or the New Caledonia single-species family, the Kagu Rhynochetos jubatus, remains unknown (Gonzaga 1996). 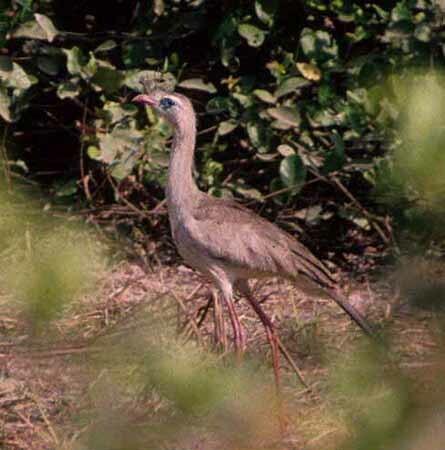 I found the Red-legged Seriema to be difficult to see in southwestern Brazil. Although pairs are highly vocal -- their loud yelping cries (like young dogs) are characteristic of the cerrado -- they are amazingly elusive in thick cerrado vegetation, and our short glimpses were usually when one or two dashed across a small opening. Seriemas are generally considered wary, and they tend to run from danger. They are surprisingly large birds -- as big as the Secretarybird in my recollection, which could be wrong -- and even reading about them ahead of time had not prepared me for their size. When foraging, birds stalk deliberately, scrutinizing the ground. Their diet is a catholic run of animal prey, from grasshoppers and beetles to snakes, lizards, and rodents (Gonzaga 1996). "Seriema" is from the local Indian word "cariama" which means "the one who wears a short crest." This crest can just barely be seen in the upper photo. Cariama is now latinized as its generic name. 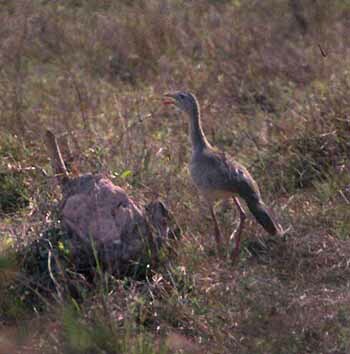 Photos: The photos of Red-legged Seriema Cariama cristata were taken in the Pantanal south of Pocone, Mato Grosso, Brazil, in July 1999. Photos © D. Roberson; all rights reserved. There is no "family book" per se of which I'm aware, but an excellent introduction to the family is in Gonzaga (1996). Gonzaga, L. P. 1996. Family Cariamidae (Seriemas) in del Hoyo, J., Elliott, A., & Sargatal, J., eds. Handbook of the Birds of the World. Vol. 3. Lynx Edicions, Barcelona.